Title: And Hellfire Is Their Name! Synopsis: After narrowly escaping the clutches of the Hellfire Club, the X-Men head west to the New Mexico mountain top aerie of the Angel, Warren Worthington III. After a brief reunion between the X-Men and their old teammate and his girlfriend Candy Southern, Cyclops and the Angel take off to a remote butte where Scott fills Warren in the carefully designed series of attacks by the Hellfire Club and his concern about how formidable a foe they have proven. Warren is surprised and tells Scott that he’s actually a member of the Hellfire Club, describing it as a very stuffy – yet risqué – establishment club. As Scott segues to his concerns about Jean’s recent behavior, she flies up with a picnic lunch and Warren returns to his aerie leaving the couple alone. Jean diffuses Scott’s tension about the Hellfire Club, saying “Stop being Cyclops, leader of the X-Men, for a while. Try being Scott Summers, lover of Jean Grey. Who knows, you might even enjoy yourself.” Jean proceeds to remove Scott’s protective visor and telekinetically keeps his optic blasts in check, demonstrating the incredible power of the Phoenix. “Hush. No questions now, my love. No words.This is our moment. Let’s not waste it.” Even Scott can’t disagree. A week later, the X-Men return to New York to mount a counter assault on the Hellfire Club. They plan a two-pronged attack with Scott, Jean, Peter and Ororo entering the Hellfire Club as guests of Warren while Nightcrawler and Wolverine crawl through the sewers to infiltrate the Club from the basement level. 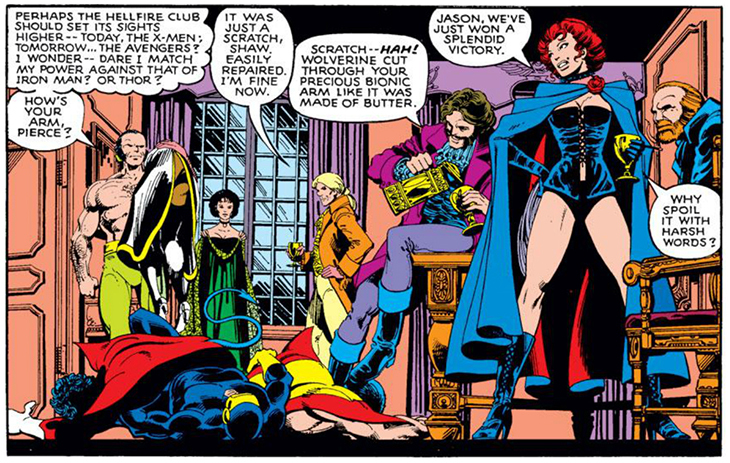 Unfortunately for the X-Men, the Hellfire Club is onto them from the moment that they set foot in the club and prepare to put into action their plan to fully subvert Jean Grey under Jason Wyngarde’s control so that she can lead their attack on her unsuspecting teammates. 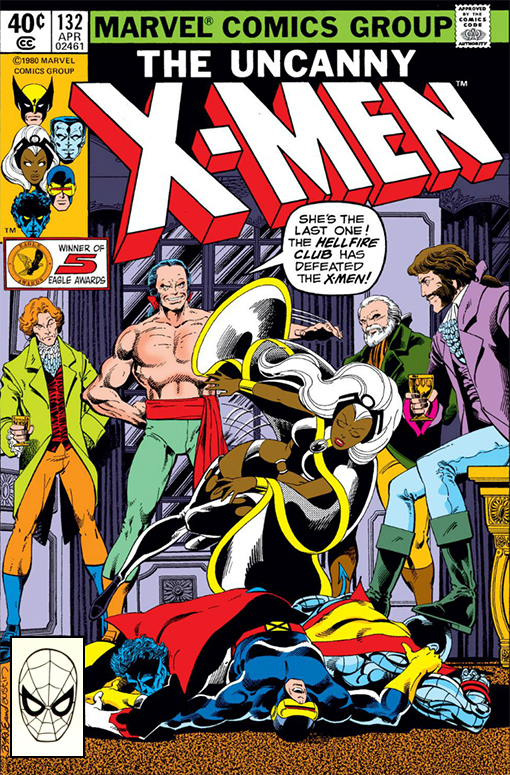 As the X-Men join the crowd of the Hellfire Club’s gala reception, Wyngarde cuts in while Scott and Jean dance, sending Jean into another timeslip so that she is cast back 200 years into a reality where she is Wyngarde’s wife and the Hellfire Club’s Black Queen. 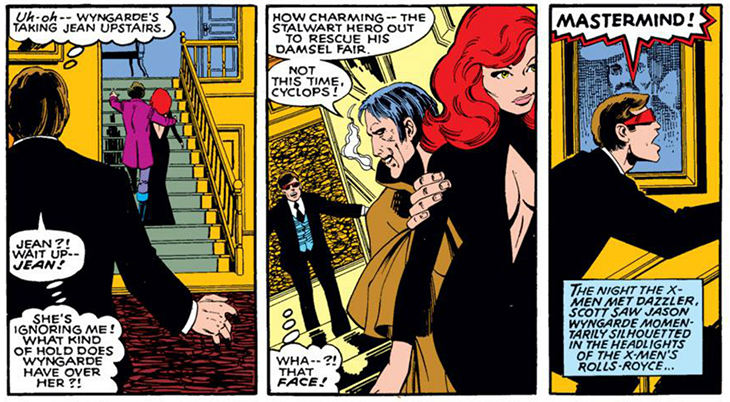 Scott is shocked and confused as Jean walks away with Wyngarde. As he follows them up the stairs,Wyngarde reveals himself to Scott as none other than Mastermind, the villainous master of illusions not seen in the pages of X-Men since he was a member of Magneto’s Brotherhood of Evil Mutants in the 1960s. Under Mastermind’s control, Jean blasts Scott and the Hellfire Club launches their attack the X-Men. Colossus and Storm spring into action and find themselves face-to-face with Sebastian Shaw. Colossus underestimates his foe and finds that the Hellfire Club’s leader can absorb his every blow and transform it into raw strength. In the basement, Nightcrawler and Wolverine are surprised by the cyborg Donald Pierce and mass master Harry Leeland. 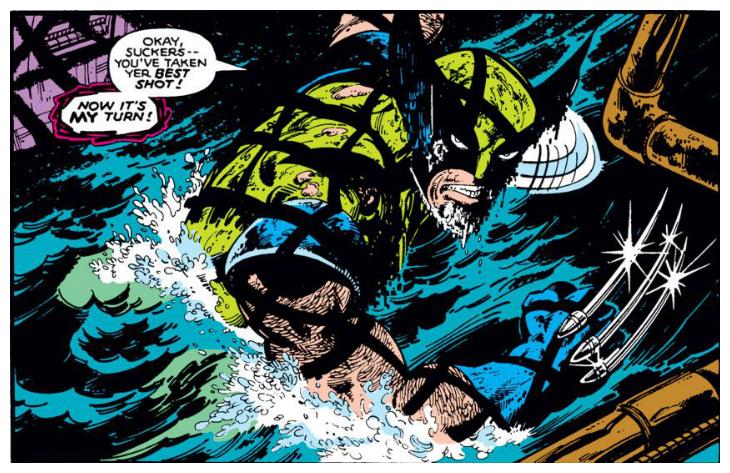 Pierce knocks Nightcrawler unconscious while Leeland drops Wolverine through the floor deep into the sewers where he is presumed dead. The issue ends with the X-Men completely defeated at the hands of theHellfire Club. This fourth installment in what I consider to be the Hellfire Club Saga – a subset or prelude to the Dark Phoenix Saga – is a thrill ride with twists and turns that captivated my interest and kept me on the edge of my seat wondering what would come next. It’s a significant issue insofar as it introduces the full complement of Hellfire Club inner circle members, reveals Mastermind as the expertly plotted surprise villain, and sets the stage for Wolverine’s truly definitive fight with the Hellfire Club soldiers in Uncanny X-Men #133. Claremont and Byrne stand the test of time like no other creative team in comic history!